The results of the midterm elections dominated both the public’s interest and media attention last week as Republicans easily won control of the House while making big gains in the Senate and in many statehouses. Fully 43% say they followed news about the election outcome more closely than any other news, according to the latest News Interest Index survey conducted among 996 adults from Nov. 4-7. News about the elections accounted for 57% of the newshole, the highest level of coverage for any story since the 2008 elections, according to the Pew Research Center’s Project for Excellence in Journalism (PEJ). Compared with the 2006 congressional elections, about as many say they followed the outcome very closely (47%) as did four years ago (46%) when Democrats captured control of both the House and the Senate. This year’s level of interest is slightly higher than interest in the midterm elections of 1994 (41%). That year, Republicans gained control of Congress. While Republicans followed campaign news more closely than Democrats throughout much of 2010, partisans tracked the outcome at similar levels. Fully 57% of Republicans and 50% of Democrats say they followed the election results very closely. Roughly four-in-ten independents (41%) say the same. However, Republicans (61%) are more likely than Democrats (42%) and independents (39%) to say the election is the story they followed most closely. Four years ago, when Democrats tallied large gains, Democrats tracked the midterm results more closely than Republicans or independents. At that time, nearly six-in-ten Democrats (58%) said they followed news about the election outcome very closely, compared with 47% of Republicans and 34% of independents. A majority (57%) followed the results of the election last Tuesday night; 52% say they did so on television. That amounts to 91% of those who followed results that night. Meanwhile, 16% say they tracked the election night outcome on the internet. That amounts to 28% of those who say they followed the returns that night. About two-thirds of Republicans (67%) say they followed results election night, compared with 55% of Democrats and 53% of independents. Partisan groups were about equally likely to track the results on the internet, though more Republicans (62%) say they watched the results on television than Democrats (50%). Six-in-ten men (60%) say they followed the results on election night, compared with 53% of women. While men and women are just as likely to say they followed results on television (53% and 50% respectively), men are almost twice as likely to say they followed results on the internet (21% vs. 11%). Those ages 18-29 are much less likely than older age groups to say they tracked results on election night; 35% say this, compared with majorities of those 30-49 (57%), 50-64 (63%) and 65 and older (67%). And while (by ratios of more than two-to-one) Americans 30 and older are much more likely to say they tracked returns on television than on the internet, young people are nearly as likely to say they followed the returns online (18%) as on television (25%). Though the election dominated public attention, Americans say they also continued to track news about the nation’s struggling economy. More than four-in-ten (44%) say they followed news about the economy very closely; 20% say this was the news they followed most closely. News about the economy made up 7% of the coverage analyzed by PEJ. Nearly three-in-ten (29%) say they followed news about terrorism plots in the U.S. and Europe very closely; 7% say this was the news they followed most closely. News about terrorism threats and thwarted plots accounted for 5% of coverage. Fewer than two-in-ten (17%) say they followed news about a hurricane that hit part of Haiti last week as that nation grappled with a worsening outbreak of cholera; 9% say this was the news they followed most closely. 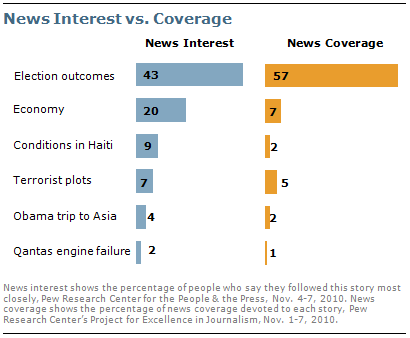 Hurricane Tomas and problems it caused in Haiti accounted for 2% of the newshole. Just 14% followed news about the start of President Obama’s trip to Asia very closely; 4% say this was the news they followed most closely. The trip accounted for 2% of coverage. Similar numbers tracked news about the in-flight failure of an engine on a Qantas Airways jumbo jet; 13% say they followed this news very closely, while 2% say this was the news they followed most closely. The incident accounted for 1% of coverage. These findings are based on the most recent installment of the weekly News Interest Index, an ongoing project of the Pew Research Center for the People & the Press. The index, building on the Center’s longstanding research into public attentiveness to major news stories, examines news interest as it relates to the news media’s coverage. The weekly survey is conducted in conjunction with The Project for Excellence in Journalism’s News Coverage Index, which monitors the news reported by major newspaper, television, radio and online news outlets on an ongoing basis. In the most recent week, data relating to news coverage were collected November 1-7, and survey data measuring public interest in the top news stories of the week were collected November 4-7, from a nationally representative sample of 996 adults. Results for this survey are based on telephone interviews conducted under the direction of Princeton Survey Research Associates International among a national sample of 996 adults living in the continental United States, 18 years of age or older, from November 4-7, 2010 (666 respondents were interviewed on a landline telephone, and 330 were interviewed on a cell phone, including 160 who had no landline telephone). Both the landline and cell phone samples were provided by Survey Sampling International. Interviews were conducted in English.